A family adventure trip can be the vacation of a lifetime, and if you want unspoiled wilderness and beautiful landscapes, then a canoeing trip to Canada is an ideal choice. If you are introducing your children to nature or helping them to appreciate it better, a canoeing holiday is great for doing so. Canoeing makes for a relaxed, leisurely experience that can be enjoyed by the entire family, taking in all that the great Canadian outdoors has to offer. Traveling by canoe is a great way to see the landscape at a slow and serene pace. Out on the water, you begin to feel immersed in your surroundings, almost like you have become part of the landscape. A canoeing vacation brings you back in time as you share in an activity that was begun by native tribes hundreds of years ago. Muskoka, Ontario: Muskoka is a region with more than 1,600 freshwater lakes to explore. Add in stunning granite cliffs and beautiful pine and maple forests and you have a pristine environment to explore by canoe. Lake Louise, Alberta: This Lake is noted, in particular, for its emerald color, the result of rock flour being carried by melt water from nearby glaciers into the lake itself. A tranquil setting, Lake Louise is a great destination for a family canoe getaway. Liscombe River, Nova Scotia: The Liscombe River offers the opportunity to immerse you and your family fully in nature while enjoying a canoeing vacation at the same time. The river is noted, in particular, for its seasonal salmon runs, beginning in June and lasting until late October. If you want an idea of the type of outdoor adventure vacations that can match your appetite for a wilderness canoeing vacation in Canada, then Outdoor-Traveler's blog is worth checking out. As a premier provider of outdoor lodging experiences with an authentic feel, Outdoor Traveler Destinations can offer you and your family the ideal base from which to explore Canada’s stunning and unspoiled wildernesses by canoe. Outdoor Traveler Destinations helps you explore the beautiful Muskoka region in Ontario, with accommodation at either the Hidden Valley Resort or the Deerhurst Resort. 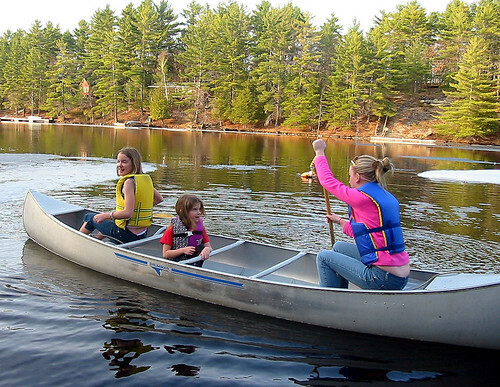 A family canoeing vacation in Canada is perfect if you want to do something at a slower pace yet experience the adventure of being in the great outdoors at the same time, spending quality family time together.